Professional events need to be inclusive, by representing a diverse range of speakers. That way everybody can be involved with and inspired by the cutting edge of their field. Too many events though don't represent any diversity at all. We want to take concrete steps to fix this from the bottom up. Hopefully this won't be an issue, but just to let you know I've signed the Minimum Viable Diversity pledge. I won't be able to speak [at this event/on this panel] if every other speaker you pick is a [man/cis woman/white person] like me. Let me know if that's going to be a problem — I'm happy to help you find speakers from underrepresented groups. In most cases this will be enough (and many events will be surprised you even think that this is a risk). If events get back to you asking for help and tips, show them the "Organizing an Event?" section under resources. I'm interested in buying tickets to [event name], but I've signed the Minimum Viable Diversity pledge, so I won't be able to attend if you pick a lineup without any diversity at all. Can you confirm that that's not going to happen? In most cases this will be enough (and many events will be surprised you even think that's a risk). If events get back to you asking for help and tips, show them the "Organizing an Event?" section under resources. Firstly, include the Minimum Diversity Pledge logo on your site, and tweet and spread the word about your commitment to show people you care. In case you're not aware, we've signed the Minimum Viable Diversity pledge. We're committed to ensuring our lineup and all of our panels include at least some degree of diversity. We are putting lots of work into bringing you a wide range of speakers and we're hoping to go far beyond this, but you can treat this as a minimum guarantee: this won't be another event filled with the same homogenous voices — we promise! 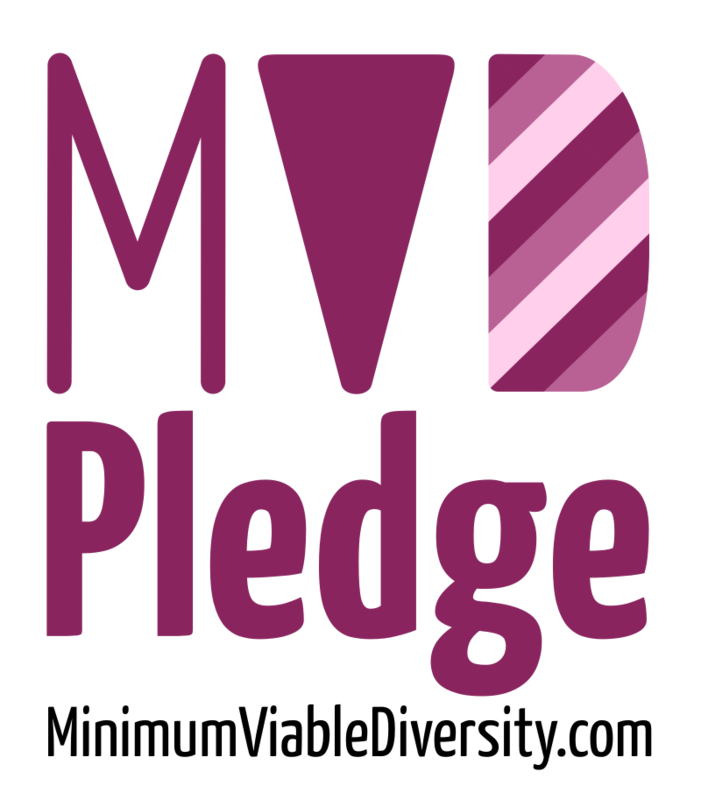 We're potentially interested in sponsoring [event name], but we've signed the Minimum Viable Diversity pledge, so we won't be able to if you might have a lineup with no diversity at all. Can you confirm that that's not going to happen? Have you checked that this event has some diversity in its lineup? 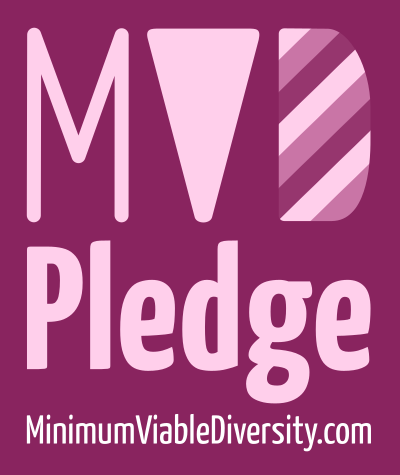 As you may know we've signed the Minimum Viable Diversity pledge. Hopefully this doesn't fall below that fairly low bar, but if it does I'd strongly encourage you to look around for other options. If you're not sure, send them an email and check. There are some quick and easy template emails for that on the pledge site itself. Let me know if you'd like us to talk to the event for you, or help you find other options. In many cases events will already have lineups including some diversity, so should just need a quick check in practice. Most events that don't will be surprised you even think that this is a risk, but just a last few won't even be thinking about this at all, and won't have a plan. These are the events we're trying to improve. Try and nudge them in the right direction, and if they need any help and tips, show them the "Organizing an Event?" section under resources. Each step here builds a culture that makes it unacceptable for an event to ignore diversity, as too many do (some illustrative examples). Remember, of course, that not all diversity is visible: give events a chance to explain where they stand and what they're doing before you reject them. When organizers have big groups of speakers warn them they'll have to drop out if they don't have any speaker diversity, and whole batches of attendees asking them to confirm that in advance, it stops being possible to ignore the issue. With an embarassingly low bar it's hard to argue it's ok.
Take a concrete step on diversity, help shut down the worst offenders, and make it inconceivable to run a paid event that ignores its responsibilities. Spread the word! Share the pledge around, tell conferences and your employer and your friends about it, and help us get as many people involved as possible, so we can make maximum impact. As well as helping and inspiring individual people from underrepresented groups, increasing speaker diversity is important because diverse groups solve problems better. We've done studies, it's measurably true, and aiming for a diverse mix of genders, races, religions, sexualities & more everywhere makes us all more successful, and the world a better place. This is important in communities generally, but especially for people in leading role-model positions, such as speakers at industry events. More diverse groups of speakers will give us conference talks and discussion with a wider range of ideas, but more importantly will also include & inspire more diverse audiences in turn. It's this multiplier effect that's key. More diverse lineups let everybody get involved in the cutting-edge of the field, help spread diversity in the community as a whole, and hopefully inspire more diverse groups of people to share their ideas on stage too. By focusing on the minimum level, we hope to get as many people as possible involved. If it becomes a common sight for organizers everywhere, nobody can run events that totally ignore diversity. The pledge can't rule out the majority of existing events, or it simply wouldn't be practical. We need to focus first on the clear worst offenders, and build up from there. The hope here is that this will cause big problems for those below the minimum bar, and the steady pressure from many pledge signers mentioning it when accepting speaking slots and buying tickets will highlight diversity further, even among events already reaching this line. This builds awareness and momentum across the board to improve diversity even further, everywhere. This is just the start though. You personally don't need to limit yourself to this minimal bar, and we'd definitely encourage you to go even further. (See resources for some suggestions). In future we also hope to extend beyond this, to steadily raise the bar and improve diversity more and more. For now though this pledge is focused on taking a pragmatic and immediate step forward, with a long road ahead. Diversity is important, and every event should have a diverse lineup. Many free events are tiny meetups organized by volunteers though, with tiny lineups, and barely enough time or resources to actively find any speakers, let alone go further and encourage diverse speakers. (See resources for some tips on doing this.) These events do need to be more inclusive too, but outright boycotts across the board would rule out many events that can't easily invest more effort to go further. Including these events in this pledge would make it impossible for many people to sign up. Events that charge for entry are a different matter: any event large & successful enough to charge for tickets has the power to provide an inclusive environment, and a responsibility to do so. These events need to be investing some of their revenue and time back into their speaker selection to guarantee at least a minimum level of diversity, and many aren't. This is where we're focusing. What do you mean by 'diverse' speakers? The short answer: it depends, but the key is to highlight a range of voices from a variety of backgrounds, especially those who aren't normally heard. Diversity is a complicated topic, and it's going to depend on the context. You may have to make your own call on this. Not all diversity is visible: many disabilities have no physical manifestation and you cannot tell if a person is LGBT just from appearance. However, a lack of visible diversity is a very clear indicator that an event is not considering diversity at all. It is the clearly failing cases that this pledge is most concerned with. When your whole lineup is white men, there's a clear problem. If you have a lineup that instead includes some women, people of color, LGBT people, and people with disabilities, you've gained some level of diversity. Existing represention of the groups in question is key. The groups to focus on are those who are otherwise frequently discriminated against, and are different to the typical speakers you'd see at your event. Adding somebody British to a lineup of Americans typically doesn't add any meaningful diversity. Adding somebody from Latin America often would. What if I'm a speaker from an underrepresented group? Sign the speaker pledge anyway to show your support. Sign the attendee pledge, and refuse to attend events that completely ignore diversity. Encourage both your company and the events you go to sign the company and event pledges. Put yourself forwards as a speaker. Add your name to the list of Speakers Who Want a Platform, follow CallbackWomen, and get your voice out there to help inspire other people like you. Aren't there existing pledges for this? There are quite a few other related pledges. Many of these are more narrowly focused aimed at a specific field or part of world. Some commit you to general rather than concrete action, or look only at panel lineups, rather than whole conferences. Many focus only on including female speakers, rather than encouraging diversity as a whole (an easy way to leave many other underrepresented groups excluded). Those other pledges have value, but they're not doing exactly what we want to do here. The goal of this pledge is to help people take specific concrete action to solve the diversity problem that appears in professional events of all sorts of fields, all around the world, for everybody. As far as we're aware, this is the only pledge doing that. What will you do with signups? Mainly just publish how many of them we get, so everybody can see how many people think this is important. The pledges also ask you for your name (or your company/event's name and logo). We're planning to eventually publish a list of the people who've signed up, and include a selection of event and company logos on the site. There is an option in the pledge to sign it but opt out of having your name published, if you'd prefer. Finally, we also collect email addresses (again, optionally). We'll never share these or spam them. They're only going to be used for very occasional later updates closely related to this pledge. There's a lot of content out there on diversity. Read some of the many articles outlining approaches to solving exactly this problem, like Ashe Dryden's incredibly detailed posts (one, two), Anna Shipman's great guide or the Hopper Fund's exhaustive walkthrough. Actively encourage submissions from relevant communities. Tweet at groups like @CallbackWomen and @DevChix for exposure to women looking for speaking events. Meri Williams also has a useful guide on broadening the responses to your call for papers, filled with tips for making this process more effective. The Next Web's top 100 women speakers in tech and business. Everybody featured in Revision Path's series of podcasts, interviewing the best black graphic designers, web designers and web developers from around the world. This list of speakers from underrepresented groups who want a platform. Journalism.co.uk's enormous list of non-male editor, executive and journalist media speakers. Peggy's list, a selection of female speakers in the marketing, advertising, creative and media sectors. The Gendered Intelligence trans speaker directory. Women and Color, a huge directory of talented women and people of color available to speak at events in or near Toronto. Women for Media, an enormous database of business, finance, government, academia and the not-for-profit speakers in Australia. Women in theoretical/computational chemistry, material science, and biochemistry, a large directory of female scientists in a range of fields. Have another list or resource people should see? Suggest it. Want a badge to show your support? Sign the Diversity Charter and promise to encourage and help event organizers commit to improving diversity more generally. They've also got their own fantastic set of resources on all this too, which are well worth a read. If you're in tech, join Project Include, a community working to provide materials, support and guidance for teams and companies in tech to improve diversity. Donate to, sponsor and support organizations like CallbackWomen, Model View Culture, AlterConf, Codebar and Stemettes. Want to extend or change this pledge? This whole site is fully open-source, available on Github, and MIT licensed. If you spot a typo, have concerns, or think there's another resource that should be included open an issue or create a pull request, and help us do better.